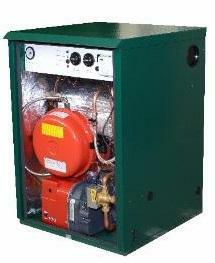 The Outdoor Combi Plus ODC1 oil boiler has been designed and manufactured by Mistral as a floorstanding boiler. It is an A rated appliance with a high efficiency rating of 93% and a 20kW output. This makes it best suited to smaller homes without a high demand for heating or hot water. For larger homes higher outputs (up to 41kW) are available. Key features of this boiler include the a multi directional flue outlet, pre punched pipe access point and a frost protection stat which is fitted as standard to protect the unit water from freezing over in the winter months when the boiler is needed most. The technology is housed in a high quality, corrosion resistant casing which enables front access for servicing and can be used in tandem operations. The integral 230V electric immersion heater means that in the event of an oil failure the boiler will provide a backup supply of domestic hot water through the immersion heater. As a Combi boiler it will supply heating and hot water on demand using the mains water supply so you don’t need a feed tank in the attic or a storage cylinder. A 5 year warranty is included as standard for your peace of mind.